In the twenty-first issue of the Bed and Breakfast Traveller, we take you to Gravenhurst, the "gateway to Muskoka". Muskoka is located ninety minutes north of Toronto, Ontario, Canada. Known as the first town in Muskoka, Gravenhurst offers visitors a picturesque resort town catering to all ages. As a four-season destination, Gravenhurst is famous for its irresistible natural beauty. Wilderness trails, steamship cruises, artisan colonies, quaint boutiques, live theatre, history and heritage, a farmer's market voted the best seasonal farmers' market in Ontario - Gravenhurst has it all. Canada's newest cruise ship will take her maiden voyage on May 18 2002. Wenonah II, the newest addition to the Muskoka Fleet (www.muskokafleet.com) is the first passenger vessel to be built in Muskoka for nearly 100 years. She joins her sister ships the Segwun and Wanda III in a variety of cruises ranging in length from one to eight hours with a few special multi-night cruises. Lunch and dinner cruises are also available. New this year on May 17-18 is Doors Open Gravenhurst. In partnership with the Ontario Heritage foundation, Gravenhurst is opening buildings and heritage areas that are traditionally closed to the public. Some of the sites include Muskoka Steamship Museum, Sloan's Restaurant, The Muskoka Fleet, Ungerman Gateway Park, and Gravenhurst Archives. Free entry to most sites. A great way to celebrate the Victoria Day weekend and Gravenhurst's 125th Birthday. Public swimming areas with picnic tables and public washrooms can be found within moments of the town centre. Local hiking trails range in length from the 2.3 km Brydon's Bay Trail to the 8 km Gravenhurst portion of the Trans-Canada Trail and are described in a handy and colourful brochure published by the Gravenhurst Chamber of Commerce. 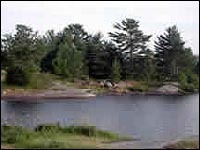 http://www.gravenhurstchamber.com/Tourism/index.html and click on Hike Gravenhurst. For further information on any of the following events, please see the Gravenhurst Chamber of Commerce website www.gravenhurstchamber.com or call 705/687-4432. June 15 - 9th Annual Antique & Classic Car Show Gull Lake Park, 10:00 - 4:00. Over 400 antique & classic cars and motorcycles from across Ontario on display. Think parasols and picnics, chamber music and sunshine! Add in artisans, bratwurst, and beer. An olde-summer Sunday afternoon by the lake. Music and fun is the focus. July 1 - Canada Day Celebrations in Gravenhurst - Begin the day with the family celebrations in Kilworthy Park at 12 noon. This free community event features children's games, BBQ, free draws, dunk tank and more. Travel back in time throughout the afternoon at Bethune Memorial House. Costumed staff will transport visitors to the 1890s by performing traditional activities throughout the home and gardens. Free for all, the afternoon will include Victorian games, cake and lemonade. Extend your stay in Gravenhurst into the evening at Sagamo Park. Free to all! Come and enjoy an evening performance by Jam Sandwich, a great family show, followed by a finale of FIREWORKS! An excellent display of the Toronto Chapter Antique & Classic Boat Society members. Over 100 boats on display at Sagamo Park. Still the largest in-water boat display in Canada. Aug. 9&10 - Sawdust City Days - downtown Gravenhurst. Logging demonstrations, outdoor beer garden and street dance, vendors, artisans and music. Aug. 16-18 - Dockside Festival of Arts, Sagamo Park - Features over 140 artisans from across Canada as well as live entertainment for the whole family.